When a young writer (Derrick De Marney) is falsely accused of murder, the local constable’s daughter (Nova Pilbeam) helps him track down the true culprit. As Peary notes, this “very entertaining” Hitchcock thriller is “sadly overlooked” — indeed, I just saw it for the first time myself last week. De Marney and Pilbeam — relatively unknown actors — are hugely appealing in the lead roles; it’s difficult not to root for them as they doggedly track down the evidence they need while simultaneously falling in love. 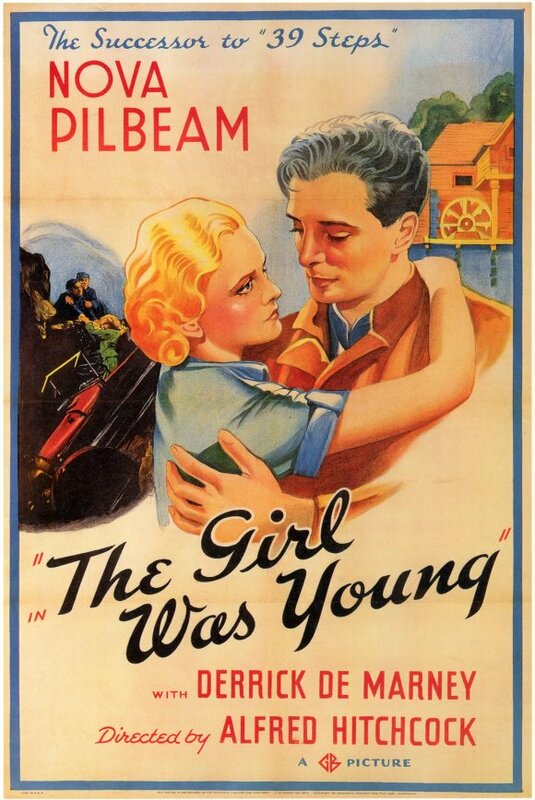 As indicated in the alternate title (The Girl Was Young), the film goes beyond Hitchcock’s standard tropes of false accusations and amateur sleuthing to focus on Pilbeam’s transformation from an independent yet sheltered girl to someone who brazenly follows her heart rather than her head. While Peary argues that the film “would have been a bit more exciting if [the couple] were ever in more serious danger than just being arrested”, I disagree, given that Pilbeam’s character is already risking quite a bit simply by abetting a suspected criminal. No, but it’s recommended, and must-see viewing for Hitchcock fans. I’m going to have to go to bat for this as a must. I know I saw it years ago but, having just revisited, I’m struck (and, in several ways, charmed) by how nicely and effectively this tale is told. As noted by Peary, it is “very entertaining” and “sadly overlooked”. As assessed here, it is more exciting than even Peary gives it credit for being. Of the two, Pilbeam has the more complex (btw: early feminist) role. One can barely keep up with the various and sundry conflicting emotions that land on her throughout the course of the movie, all of which are heightened not only by the fact that she’s a constable chief’s daughter but also because she is the eldest child and the only daughter in a large, motherless household. (I esp. like the sequence around the dinner table, in which, surrounded by her brothers, she overhears her father on the phone discussing the strong possibility that De Marney may have been found at last.) What makes the film’s final shot (a hold on Pilbeam’s finally relaxing and smiling face) so satisfying is that we finally see this character happy at last – and we’ve so wanted her to be for as long as we’ve watched her. The kinetic spontaneity of ‘Young and Innocent’ (as well as that of some others in his mid-career) stands in stark contrast to a number of Hitch’s later, more studied films. And though there’s less overt action, what’s here (esp. one very unexpected sequence involving Pilbeam’s car) is gripping. Early on, Hitch can be spotted in one of his more animated cameos. Fave scene: the ‘Road Up’ sequence, esp. the little ‘joke’ at its conclusion.